what is aspell ? it's a GNU Aspell is a Free and Open Source spell checker designed to eventually replace Ispell. It can either be used as a library or as an independent spell checker. 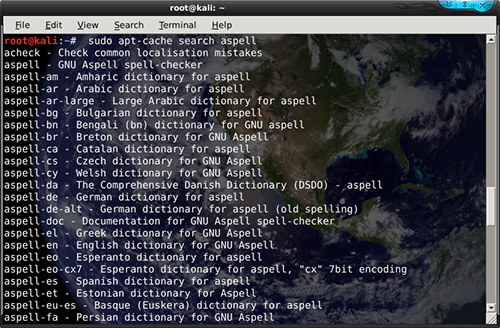 it's a GNU Aspell is a Free and Open Source spell checker designed to eventually replace Ispell. Its main feature is that it does a much better job of coming up with possible suggestions than just about any other spell checker out there for the Englishlanguage, including Ispell and Microsoft Word. It also has many other technical enhancements over Ispell such as using shared memory for dictionaries and intelligently handling personal dictionaries when more than one Aspell processis open at once. 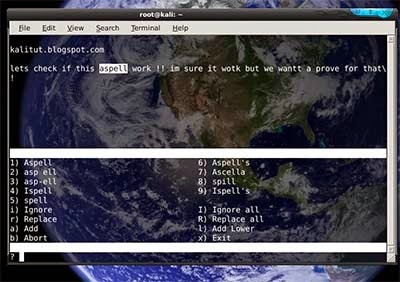 Send a brief Aspell Utility usage message to standard output. help Send a detailed Aspell Utility help message to standard output. Send the current value of to standard output. First, let’s see how to install it, in case it’s not already install on your Linux desktop or laptop. If you are using Ubuntu you just execute the command # sudo apt-get install aspell. If you are using Fedora Core or a Linux flavor derived from Red Hat Linux you execute # yum install aspell. If you are using a different distribution of Linux please look for a binary package of aspell or head to the project’s website and download the source version and compile it. I will now proceed with the assumption that you have aspell installed. aspell will go through the document and check it for spelling mistakes and return with an interactive interface where you can go through the document at hand and aspell will suggest spelling correction options. This interface is very easy to use and all the instructions are visible at all times. aspell‘s suggested spelling options will be available as numbers, as well as options to ignore a particular instance of the spelling or all of its instances. When you are done with checking and correcting the spelling errors you can either hit x to save the changes and exit the document, or you can hit b to abort the session without saving the changes you made. You may have some basic dictionary installed along with the installation of aspell, however, there are several dictionaries available to be installed. To see some of the ones available to you execute the command # sudo apt-cache search aspell if on Ubuntu, or # yum search aspell on Fedora. You can download additional dictionaries and improve your database of words.